The G1-like gene from the Lycium chinense was cloned and transferred into N. tabacum. Evidence showed that endogenous JA accumulation was crucial to LcGR gene expression in cadmium-stressed L. chinense. Glutathione reductase (GR) plays a vital role in glutathione–ascorbate metabolism and is a key enzyme in maintaining the redox state in plants. Jasmonic acids (JA) are important hormones regulating protective responses against bacteria and mechanic damage in plants. At present, the relationship between the endogenous JA accumulation, the glutathione (GSH) content and GR gene expression in plants under cadmium (Cd) stress has not been elucidated. This study primarily aims to explore their interconnected relations. First, we isolated the GR1-like gene from Lycium chinense (LcGR). Real-time PCR showed that gene LcGR and allene oxide cyclase (LcAOC) (a JA synthesis gene) expression in L. chinense plants was significantly enhanced by CdCl2 and reduced by CdCl2 cotreatment with 12,13-epoxy-octadecenoic acid (EOA), a JA synthesis inhibitor. Meanwhile, the JA content in plants strongly increased under Cd stress and decreased under Cd + EOA treatment, which was in accordance with expression pattern of LcAOC. The function of gene LcGR was confirmed in vitro with E. coli expression system. 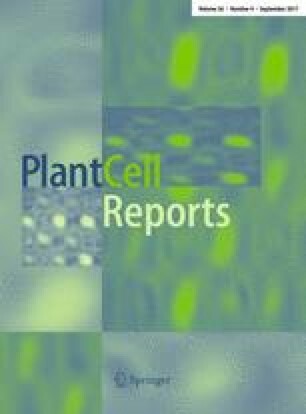 The subcellular localization in chloroplasts of LcGR gene was proved in Nicotiana tabacum leaves with transient transfection system of Agrobacterium tumefaciens. Furthermore, the overexpression of gene LcGR in the transgenic tabacum led to great Cd-tolerance and higher GSH accumulation. Overall, the results showed that the endogenous JA accumulation in Cd-stressed plants affects the GR expression which is crucial to the GSH accumulation and GSH-dependent tolerance to cadmium in LcGR transformants. Communicated by Dr. Kathryn K. Kamo. The online version of this article (doi: 10.1007/s00299-017-2168-2) contains supplementary material, which is available to authorized users. This subject is supported by the National Science and Technology Major Project of China on GMO Cultivation for New Variaties (No. 2014ZX0800302B), National Natural Science Foundation of China (Nos. 31271793 and 31271419), Tianjin Research Program of Application Foundation and Advanced Technology (No. 15JCQNJC14700). The authors have declared that they have no conflict of interest.